As you may know Lalaloopsy's were once rag dolls who magically came to life when their last stitch was sewn. 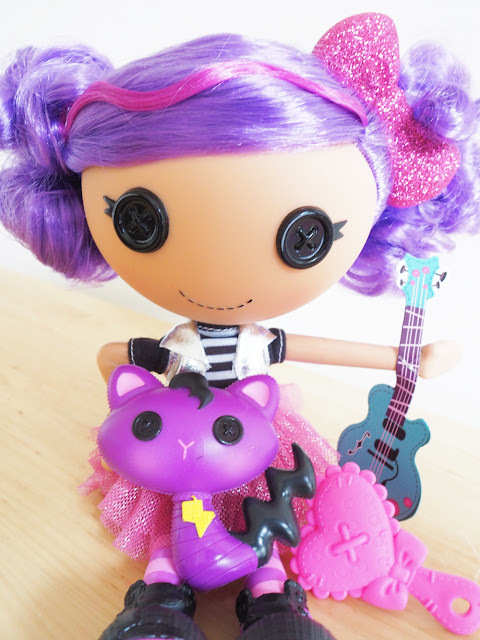 As well as being cute and wholesome, Lalaloopsy offers girls a whimsical world of characters that also have unique personalities. That is exactly the case with the Lalaloopsy doll we were sent to review. Introducing Storm E Sky!!! She loves music and loves to rock out. Her individual look with purple hair and funky clothing makes her stand out at festivals and she encourages girls to be unique and different and have their own sense of style. 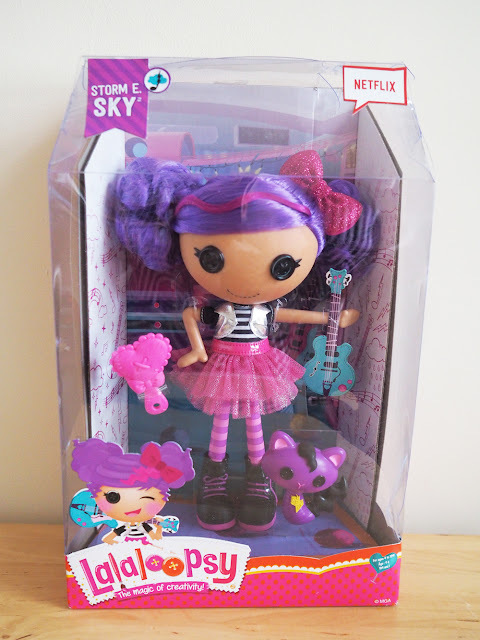 This character joined the other characters in Lalaloopsy land recently on the Netflix Episodes that you can now watch. 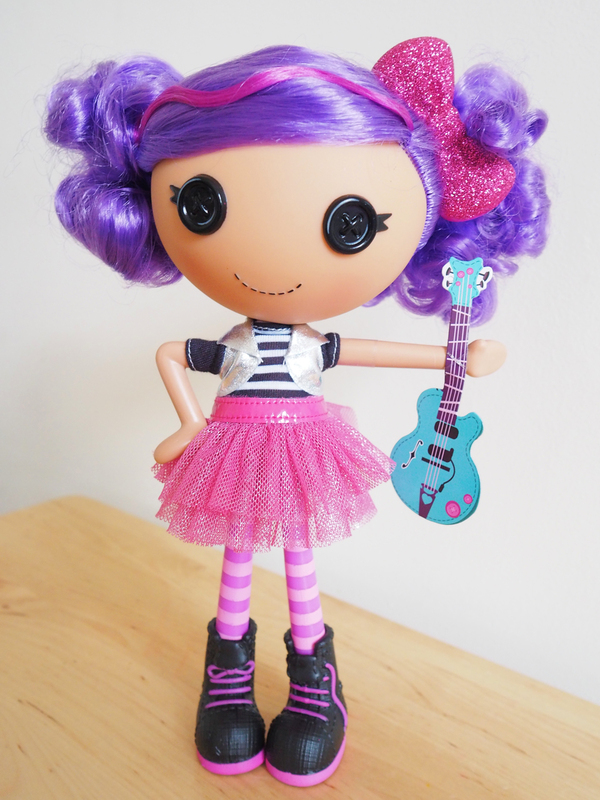 One of the new things about this new range of Lalaloopsy dolls is that they have real hair! As you can see, Storm E Sky's hair is nothing other than impressive. 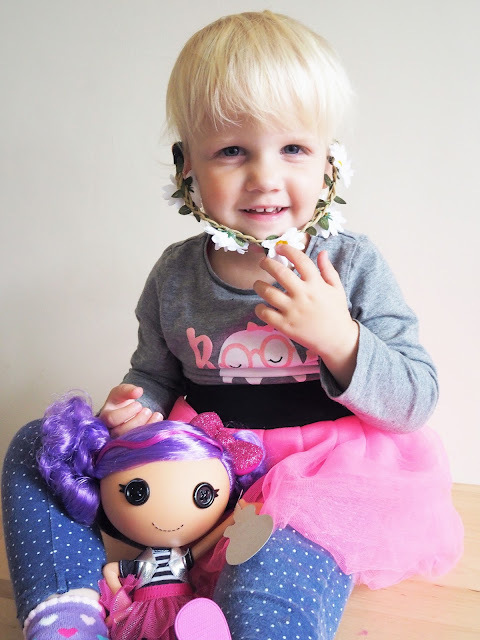 Her bright purple pigtails with pink wave in her fringe looks great and her sparkly bow just finishes the look off. I really do love Lalaloopsy's appearance with her cute button eyes and sewn on smile. She is one doll I have always looked at and really admired the design of. Being a doll collector myself, Lalaloopsy is one kind of doll I am happy to collect for Lily. Storm E Sky's outfit is brilliant and you can definitely see the music influence in it. Its super colourful and the pink tutu and leggings go really well with her hair. 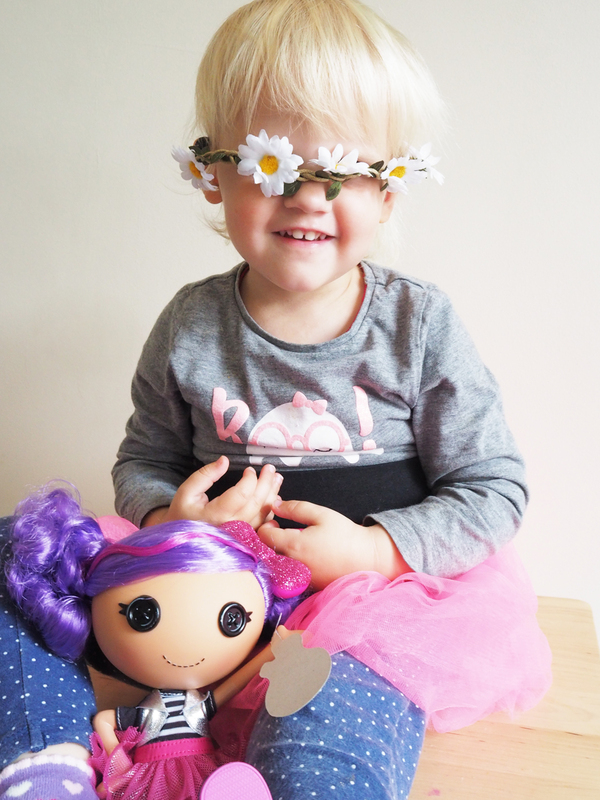 You really can't beat a cute tutu for fashion! Then her boots totally rock and are definetly festival ready! She also comes with a pink heart shaped brush, a pet cat and cardboard guitar. I actually wish that the guitar was made of plastic too. It would have made the perfect accessory for her. But the cat she has is very cool. It is no ordinary cat. It is purple and also has button eyes and funky shaped tail. I wish I had a cat as cool as that! Lalaloopsy stands quite well, but it seemed only for a short amount of time before she tumbles face first to the floor. If I was Lalaloopsy I would be inclined to provide stands with the dolls so then they could be displayed stood up rather than stored away in a toy box. They really are just to cool looking to be hidden away and they look brilliant stood up. Her legs do move though and you can also make her sit as well as stand. She sits really strongly and doesn't fall backwards. There was one more thing that made receiving this Lalaloopsy more fun!! and that was that we got sent some festival gear so Lily could also be festival ready and join in with Storm E Sky in looking cool! 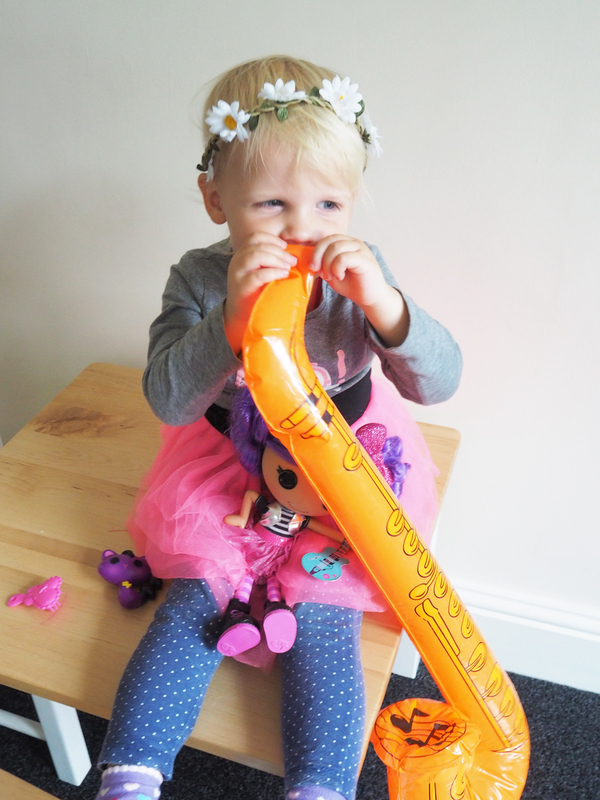 We were sent a Tutu, a Daisy Headband, some Glitter and a blow up Saxophone. I didn't put the glitter on Lily as she is a little to young for it. But she looked brilliant in her clothes and really enjoyed looking just like Storm E Sky. She thought the Saxophone was great and pretended to play a tune on it. Overall we are in love with Storm E Sky and we think she ROCKS! She is definitely one you should add to your collection. Head to the Lalaloopsy website now to find out more. What do you love about Storm E Sky? Doll is nice and colourful. As you say would be better if guitar wasn't cardboard ( as unfortunately not really durable). Yet we would like children to be interested in music, music making, etc. Like the cat, I had a pet cat some years ago :- great company, and easier to care for than a dog. I do love dogs, though not easy to provide the needed care, exercise, etc when working and having other commitments. So love when outdoors and meet people walking their dogs, allows some time to interact with dog /s and owner/s. Hope Lily has lots of fun with her new doll. Doll looks great, accessories could be better. Though child could have lots of fun playing with the doll. Lily looks like she is having fun with her new toys.